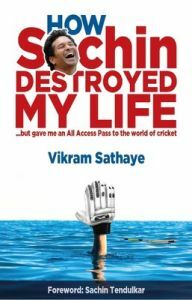 How Sachin Destroyed My Life by Vikram Sathaye, chronicles how Vikram accidentally became a stand-up comedian and cricket humourist and got to live the ultimate fan boy dream of having an All Access Pass to the world of Indian Cricket, and being up close with the team for more than a decade. The book documents his incredible journey of Indian Cricket as he takes us inside dressing rooms, hotels and the inner thoughts of leading cricketers. With a foreword by Sachin Tendulkar, this book is laced with crackling humour and brimming with interesting anecdotes, insights, quotes, and candid photographs, from cricketing legends like Sachin Tendulkar, Rahul Dravid, Yuvraj Singh, Virender Sehwag, among others. This book promises to reveal many more inside secrets! Vikram Sathaye has the distinction of being the first English Stand-up Comedian in India and has performed in more than 1,200 corporate events across the world over the last 11 years.An MBA in Marketing from the Symbiosis Institute of Business Management, Vikram worked for 7 years with companies like MTV and PMG. While at MTV he had been performing stand-up sketches along with the MTV VJ’s since 1998. In 2003, he got the opportunity to be part of Extra Innings on SET MAX as a cricket humourist. On his return he was offered to perform a sketch at the 2003-2004 CEAT Cricket Awards. Encouraged by the overwhelming response from the audiences Vikram then launched himself as a professional stand-up comedian.His television stints include being a presenter on SET MAX during the World Cup in 2003 and Champions Trophy 2004, India’s Tour of South Africa on ESPN Star Sports in 2006 and the ICC World Cup 2011 on IBN Lokmat.His stand-up repertoire includes everything from sports, politics, current affairs, Bollywood, to popular culture and solutions for marital disputes.As an entrepreneur, Vikram is the Director of a sports and entertainment company called White Copper Entertainment Pvt. Ltd. He is also one of the founding member of “Bawraas” - an initiative along with Bollywood musicians Swanand Kirkire and Shantanu Moitra, to support young promising Indians who have taken up unconventional careers. Another interesting activity he is involved in is “Think Cricket” - a platform started along with leading cricket expert Harsha Bhogle and Anita Bhogle aimed at senior corporate executives, to discuss all matters cricket.